Scott Kingery's first two games at Triple-A has included a pair of home runs, a stolen base, and perhaps the best catch you'll see in any baseball game in 2017. On Sunday, the two-year anniversary of his first professional game in the Phillies organization, Scott Kingery received the news that he was being promoted to Triple-A Lehigh Valley. The Phillies’ brass probably couldn’t be any more pleased with the progression of Kingery, a 23-year-old second baseman tapped with the team’s second-round pick in the 2015 MLB Draft. In the span of 24 months, Kingery is one step away from the major leagues. 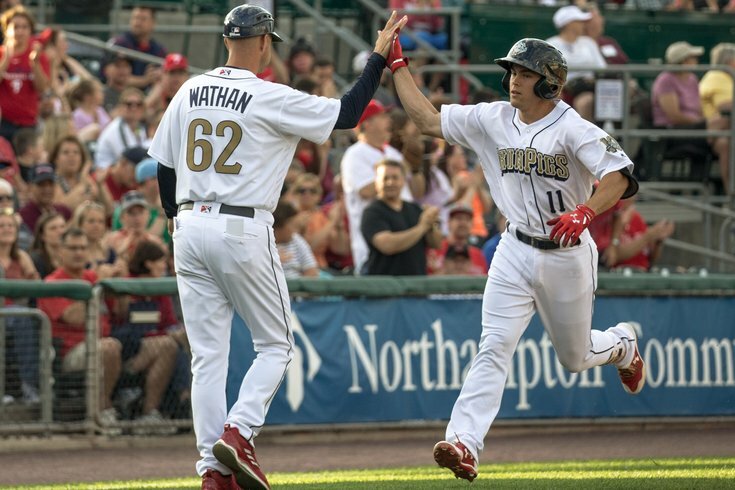 After dominating the competition in Double-A, Kingery wasted little time in keeping his breakout 2017 season going in his first 28 hours with the IronPigs. So let’s recap those first two games at Triple-A. Yes, the second part of that tweet included what followed his first Triple-A hit. OK, let’s do the math: Kingery has begun his Triple-A career by going 3-for-10 with two home runs, a stolen base, and arguably the most ridiculous catch you’ll see at any level in 2017. Kingery now has 20 home runs in 71 games (327 plate appearances) between Double-A and Triple-A this season, which is tied with Oakland prospect Renato Nunez for the most in minor league baseball. We’ve written a good bit about Kingery in the last seven months, including his unpredictable power surge this season (and friendship with Yankees rookie sensation Aaron Judge), and also about his chip-on-his-shoulder path from under-recruited Division-I walk-on to conference player of the year and top professional prospect. Phillies fans are obviously eager not only to keep reading more about Kingery’s exploits, but also in seeing him trade in his ‘Pigs clothing for red pinstripes. As we explained the other day, there’s still a decent chance that won’t happen in 2017 because Kingery does not have to be added to the 40-man roster this winter, while a few other top prospects do, and the math may not work out in his favor. Then again, if he keeps hitting as he has in the first three months, perhaps all bets are off. Kingery will surely be in the major league mix come spring training 2018. Until then, you might want to plan a day trip to Allentown. You can also see Jorge Alfaro, J.P. Crawford, Andrew Pullin, Rhys Hoskins, and International League home run leader Dylan Cozens (18 homers, one more than Hoskins’ 17) while you’re there, too.